Last Saturday, I found myself watching Moonraker. I haven't seen it for years, yet as the action unfolded - the hovercraft gondola, the fight in the glass museum, the cable car and so on - I always knew exactly what was going to happen. 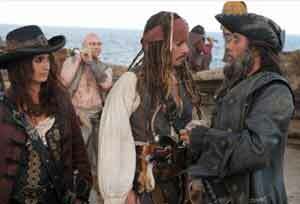 Watching Pirates of the Caribbean: On Stranger Tides is a similar experience - except I haven't seen it before. True, each set piece is slickly presented, fast-paced, high octane stunt worked interspersed with broad slapstick humour, but it's all so forehead-slappingly predictable, it's hard to get too excited. The fourth film in the Pirates trilogy sees our rascally hero, Captain Jack Sparrow (Johnny Depp), in search of the Fountain of Youth (unsure why, as Depp has clearly already found it). But he's not the only one: the Spanish and English courts are also hot on the trail, as too is the notorious pirate Edward Teach, aka Blackbeard (everyone's favourite dodgy antique dealer/Wild West entrepreneur Ian McShane) and his feisty daughter Angelica (Penélope Cruz). And so ensues a sort of nautical Cannonball Run, as our dysfunctional teams set sail to nab the prize. 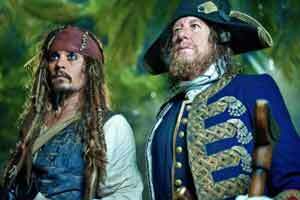 After the epic bombast of At World's End, On Stranger Tides attempts to return to basics: get Captain Jack Sparrow into some comical situations; get him out again. But new-to-the-franchise director Rob Marshall (Chicago, Nine) just can't help himself, and so we find tedious, half-baked ideas about faith, good and evil creeping in, along with a side plot about a missionary and a mermaid which, despite sounding like the opening gambit for an excellent joke, nobody in the audience gives a stuff about. To say I was disappointed by On Stranger Tides would be unfair, given that I wasn't expecting that much in the first place. And, despite all of the above, I did enjoy the film: it's a cheerful, action-packed, bonkers, rum-soaked romp helmed by Johnny Depp at his most devastatingly handsome. What's not to like?